Half Moon Run in Montreal or Quebec City? Inform me about the next events for Half Moon Run. Enroll yourself to our priority waiting list for Half Moon Run to be alerted when new tickets are available. Filling this form doesn't engage you to any purchase. Half Moon Run will be performing with the Montreal Symphonic Orchestra at the Montreal Maison Symphonique on September 26th and 27th, 2017. 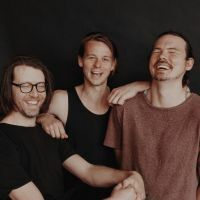 Half Moon Run's career has skyrocketted over the last few years, since the release of their first album Dark Eyes, in 2012. With a new album released in the fall of 2015, Sun Leads Me On, the young Montreal-based band keeps the train rolling on the way to superstardom. Don't miss this amazing live act, back in their home turf of Montreal, in September !